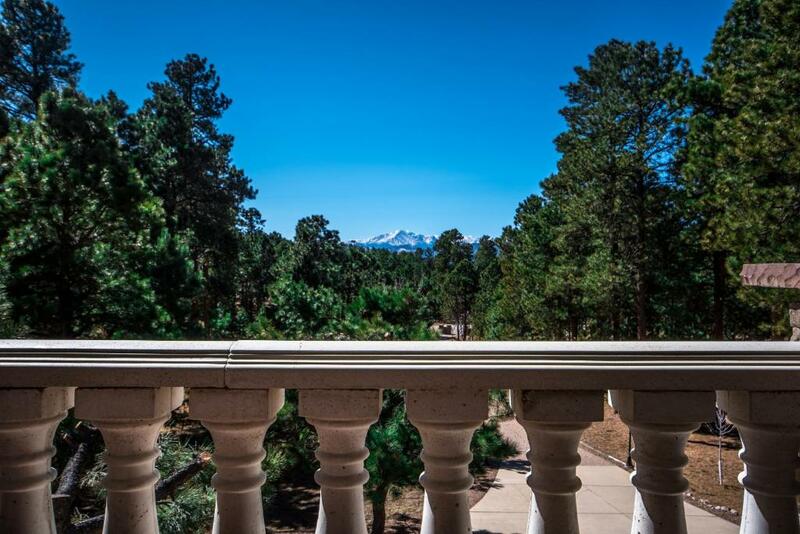 Offering free WiFi and mountain views, European Nobility Resort is an accommodations located in Monument. Featuring a terrace, the holiday home is in an area where guests can engage in activities such as hiking and table tennis. Providing access to a balcony, this air-conditioned holiday home comes with 5 separate bedrooms. A dishwasher and an oven can be found in the kitchen, and the property has 2 bathrooms. Colorado Springs is 22 mi from European Nobility Resort. Colorado Springs Airport is 23 mi from the property. When would you like to stay at European Nobility Resort? This holiday home has a patio, cable TV and seating area. Five Diamond Hotel Alternatives, LLC (FDHA) offers you this 7,957 SF luxury home that has 5 spacious bedrooms, 6 bathrooms, 7 fireplaces, on 3 private, wooded acres and sleeps 16 people. The home has 2 KS beds and 6 QS beds. This home Is 3 miles east of I-25 & Baptist Road. FDHA invites homeowners to add their homes to our site for FREE. 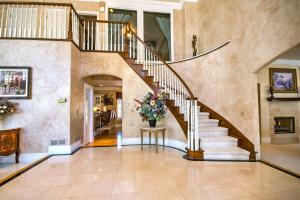 FDHA then reserves their homes for guests, if the homes meet our highest standards of excellence. This magnificent five-diamond home reflects the characteristics of the ultimate in luxury and sophistication. Accommodations are first class. The physical attributes are extraordinary in every manner. We meticulously serve and exceed all guest expectations while maintaining an impeccable standard of excellence. This fully-furnished spectacular 7,957 SF five-diamond property has 5 spacious bedrooms with ceilings ranging from 10' - 17'; 6 Bathrooms; 2 KS beds, 3QS beds and 3 cozy QS sleeper sofas; 8 additional sofas (totaling 11); movie theater, ping pong table, pool table, 3 Car Garage; and easily sleeps 16. Pets are allowed. Five Diamond Hotel Alternatives, LLC (FDHA) invites homeowners to add their homes to our site for FREE. FDHA then reserves their homes for guests, if the homes meet our highest standards of excellence. To qualify for the Highest FDHA rating, the homes we select and approve for inclusion on the FDHA site must meet the highest criteria. The FDHA home must reflect the ultimate in luxury and sophistication. Accommodations must be first class. The physical attributes must be extraordinary in every manner. Additionally, the vacation home owner must meticulously serve and exceed all guest expectations while maintaining an impeccable standard of excellence. 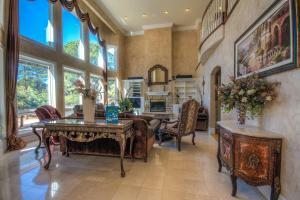 Five Diamond Hotel Alternatives provides ultra-luxury properties in Colorado Springs and Monument, Colorado. 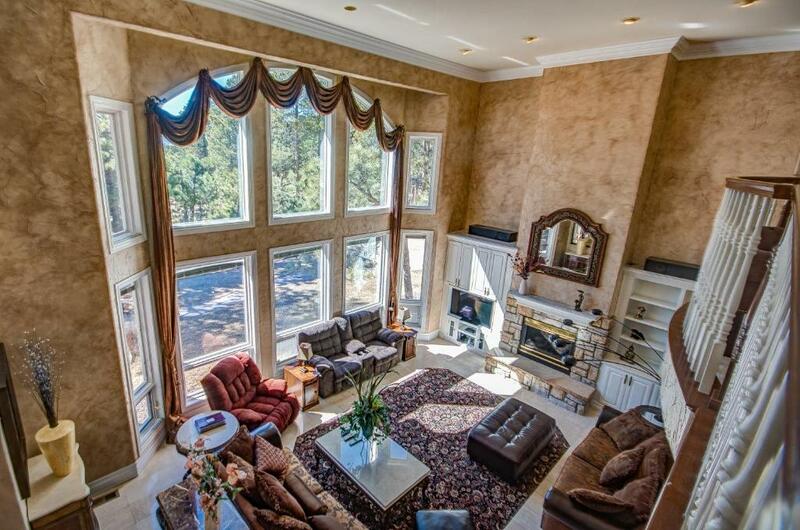 This luxury home is easily accessible to everything-- only 3 miles east of I-25 and Baptist Road in Monument, Colorado-- and is just 5 minutes north of Colorado Springs. This three-level home is situated on three private, wooded acres. When the full moon is out, the sky is blue at night and the 3-acre lot is illuminated by a soft white glow that makes the snow shine and sparkle in the winter. The home has an exterior of marble and stone with a main outside entrance that is completely encased in Venetian marble with 25 feet tall marbled pillars and ceilings 25 feet high. As you enter the home, you walk into the grand room with 22-foot ceilings, massive ceiling and base moldings, Italian marble floors and a wall of 22-foot tall windows with breathtaking views of Pikes Peak and the mountain scenery. The five bedrooms are very spacious. This magnificent property is located just 5 minutes north of Colorado Springs, on a private 3 acre lot, and is easily accessible to all activities and events in Colorado Springs. Many activities, events, shopping and restaurants and just 10 minutes from the property. The Air Force Academy is also just 10 minutes south of the property. House Rules European Nobility Resort takes special requests – add in the next step! A USD250 damage deposit is required 7 days before arrival. This deposit will be fully refunded 7 days after check-out, as long as there isn't any damage to the property. European Nobility Resort accepts these cards and reserves the right to temporarily hold an amount prior to arrival. Please note that a valid credit card is required upon check-in for incidentals. Contact the property for more information. Please inform European Nobility Resort of your expected arrival time in advance. You can use the Special Requests box when booking, or contact the property directly using the contact details in your confirmation. A damage deposit of USD 250 is required. The host charges this 7 days before arrival. This will be collected by credit card. You should be reimbursed within 7 days of check-out. Your deposit will be refunded in full by credit card, subject to an inspection of the property. We need at least 5 reviews before we can calculate a review score. If you book and review your stay, you can help European Nobility Resort meet this goal.